Ask us anything about Ocracoke: history, day-to-day life, the geography, where things are, how places were named, anything! To get you started, here are some actual visitor questions Smartypants had to answer. No question is too dumb! Well, yours may be, but Smartypants'll answer 'em anyway. Read, learn, ask for more! What's that big bird on South Point Road? What's In That Sea Foam? 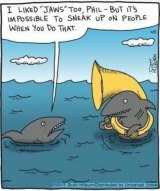 Q: Are there sharks in the sound? Call Me Later – You're Breaking Up! Q: If we use our cell phones out here are we charged international rates?